About time, if you ask me. The Public Accounts Committee's job is to follow up on the reports of the Audtor General so by nature it is supposed to be a pain to some people, especially in the government. The Committee's main goal, however, is to offer solutions via Parliament, not create more problems. Our PAC has been anything but that of late an when it comes to the 1MDB. The Committee seems to become trouble makers instead of trouble shooters in pursuit of personal glory and gain or driven by prejudice and hate, judging by the conduct of one or more members. The fact that the PAC can't sack its own members has probably emboldened them. 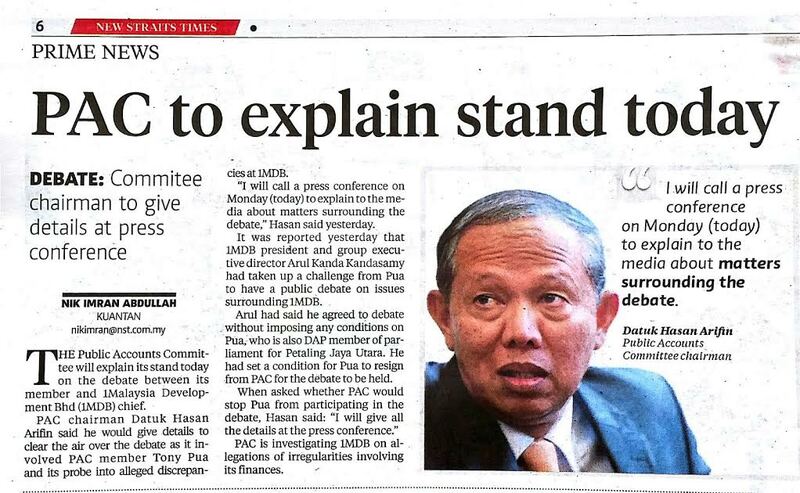 I'm not sure what Hassan Ariffin about the circus that PAC committee memebr Tony Pua has started re his debate dare with 1MDB's Arul Kanda but the PAC chairman will have a tough time convincing people that the PAC isn't actually acting as a judge, jury and executioner if it condones Pua's personal persecution against Arul and 1MDB. 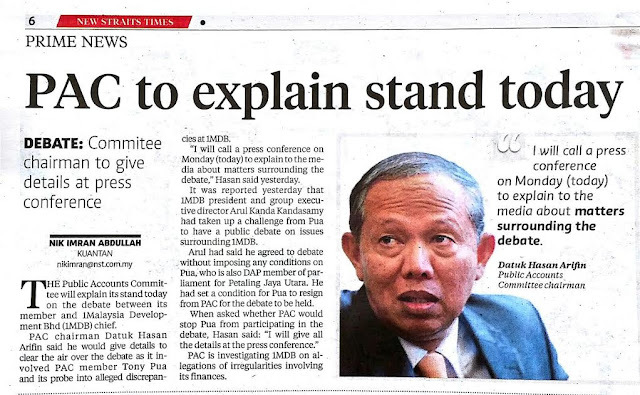 The PAC chief seemingly condoning the debate by telling the media it is up to tony if he wanted to debate. Get your shield on Arul you will be skewered. So what will he say when Tony Pua ask him what are Gold Star business activities that merit it to get USD700 million from 1MDB? Nobody have answered that. After many layers of transactions, did it go into a personal bank account? Just like Nothing2Hide, quick find excuses to cancel the debate! Before it's too late! i thought so, not only they chicken out but using other means to stop it. if you asked me la. We created the circus bro, nobody else but us. Thus stop blaming the clowns.